Lovely day for it. 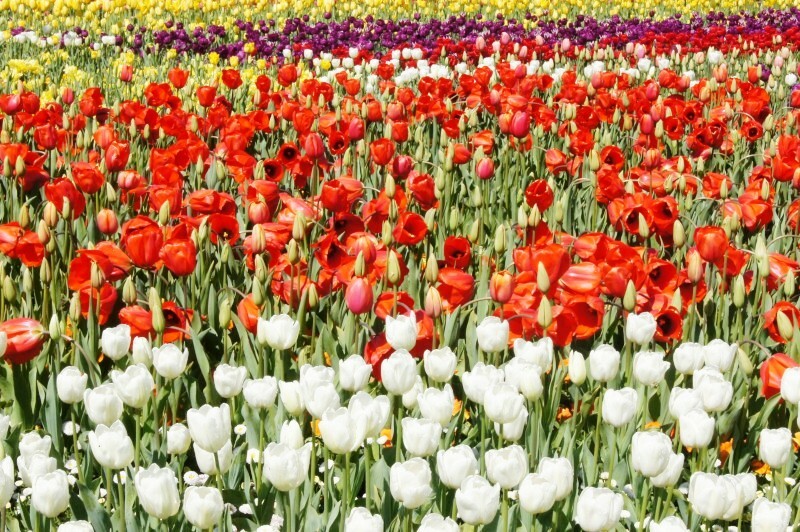 In Full Swing was playing at Floriade, Canberra's annual festival of flowers, more specifically, tulips. 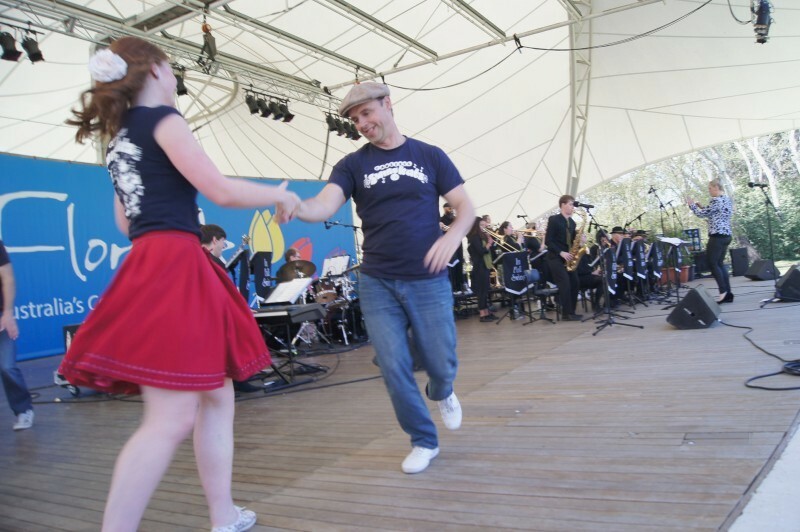 The band was on the big stage; the swing dancers were off to one side having a ball, looking all the world like the fifties; I recognised a few mates were on stage (I learnt later than had played with IFS but were filling in for this gig). The songs were standards and big numbers and some newer names (Shirley Bassey, Bette Middler, Natalie Cole) and a Sam Nestico chart and funk and shuffle and my favourite was Bacharach's brooding Look of love and the final Zoot suit riot was a blast. This is fun music and the band is big and strident. 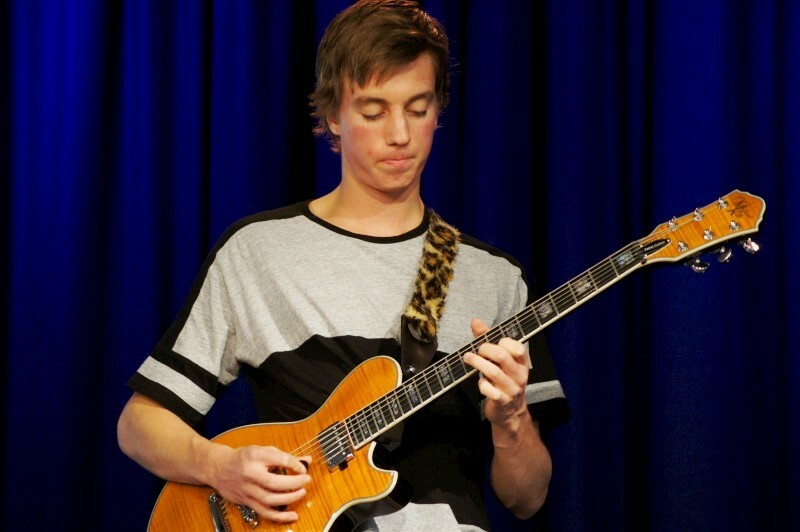 I drool over the ensemble sounds of big bands but less so for the solos, even from the best players (I think it's something to do with the short windows on offer) but I was blown out by Mitch Preston's urgent fours. Beth Way led the band as conductor and musical director. Singer Jace (?) sang firm and powerful with deep vibrato, perfectly fitting Big spender and the like. The enjoyment and energy was infectious, even at 10am on a bright spring day. What a satisfying band! Enjoyed it lots. 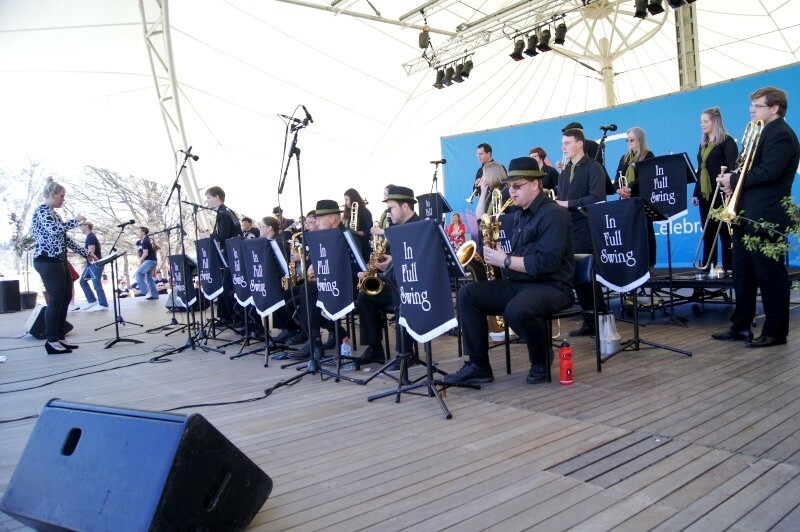 In Full Swing played on Stage 88 for Floriade under Beth Way (conductor, musical director). Megan's in London and attending a few concerts. One was at St Martin's in the Field, covering a slew of pop classics. It was not an opportune choice. You can travel through summertime Europe and hear Albinoni and Four Seasons and the like wherever, capably played but very workday performances. The red and black posters give it away; they are everywhere (they have even come to Manuka, if only rarely). It's amusing to see the musos lope out afterwards, non-plussed. 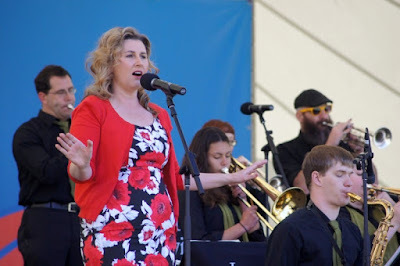 Megan observed that the concert was good but we see as good in Canberra, if less frequently. So it was exciting to attend a second challenging performance in two nights, here, at Welsey. First was Australian Haydn Ensemble, all period instruments and classical dignity. Second was Foray Quintet playing Mendelssohn, Shostakovich and Dora Pejacevic in a program called Vatra (Croatian for "heat"). The Croatian reference was to Dora Pejacevic, a woman of leftist leanings who left her noble Croation background to pursue music in Germany. She died in 1923, aged only 37, having written 106 compositions. Foray played her piano quintet in B minor op.40. Interestingly, Kimberley introduced this piece with the quintet playing key themes in each of the four movements. An excellent orientation to a fiery piece written during WW1. The Mendelssohn was the opener, two movements from his piano trio no. 1 in D minor, played to leaven the program a little. The main work, after interval, was Shostakovich piano quintet in G minor op.57. It's a complex piece in five movements written in the Stalinist Russia, in threat of denunciation, in a tumultuous year fur the USSR during WW2. 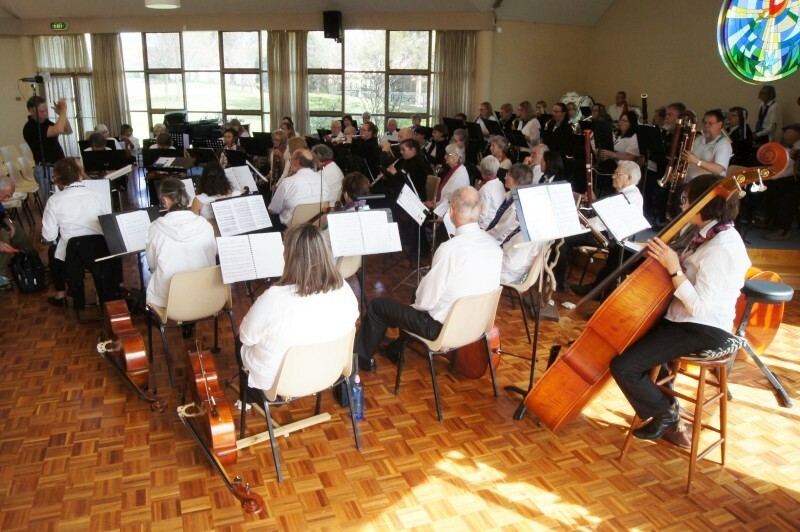 I was enamoured by the music, enjoyed the playing by all, although I particularly took note of Kimberley's piano and watched Annie's bowing and the ring-in violinist Lidia who did a great job at short notice, sharing the first violin seat with Elyane. Foray are brought together from several cities to tour every now and then. This was such a pleasure and such a diverse offering from that of AHE just the night before. A convincing performance that would have been a worthy, and probably more satisfying, alternative to Megan's outing in that London field. Foray Quintet performed Shostakovich, Pejacevic and Mendelssohn at Welsey. 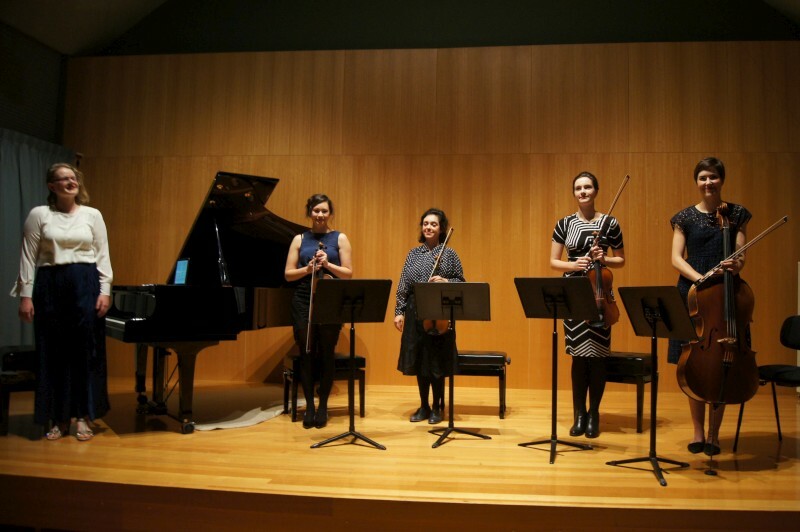 Foray comprised Kimberley Steele (piano), Elyane de Fontenay (violin), Lidia Bara (violin), Sarina Walter (viola) and Anneliese McGee-Collett (cello). It's always such a joy to catch Australian Haydn Ensemble. 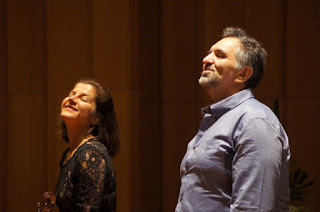 Admittedly they are friends and almost like family, but also because their music is intimate and dignified, light and joyous, and played with great ease and refinement. I follow Jacqueline, of course, bassist, quick and bouncy when required (which is often enough with music of this era) or easy and rich. She was paired this day with cellist Anton and the pairing worked a treat. Then our local import, Erin, conducting from the harpsichord chair, and leader Skye and second violin Matthew and viola James. And that period flute tone from Melissa. The whole works as a lovely team but the programs are also something to note. 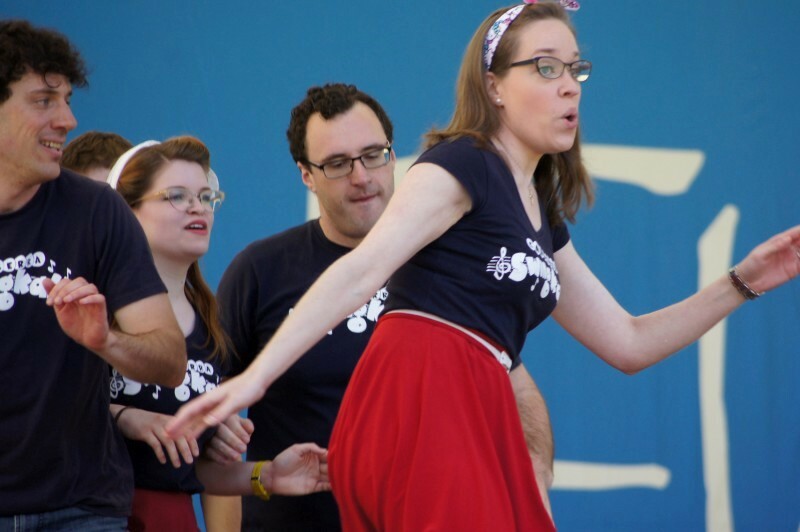 Each performance has a theme, often featuring obscure names, other times inviting guests. This time it was a fully Haydn program, with a Michael Haydn string quartet to start, then a symphony and two arias from Joseph.. 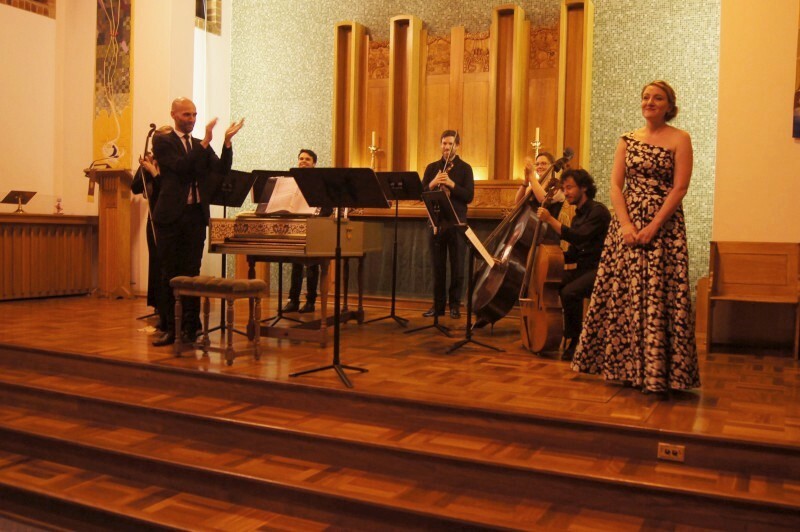 Visiting soprano Celeste Lazarenko sat in for the arias and a surprise Mozart song as encore. 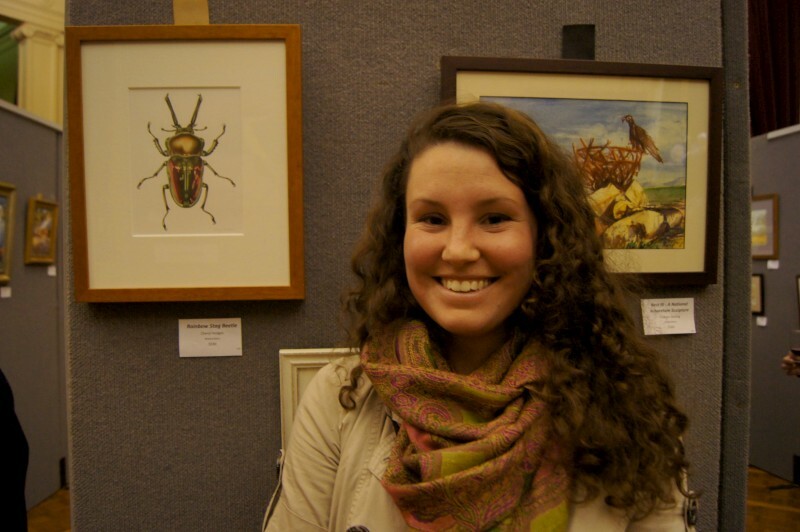 Celeste replaced Taryn Fiebig and the Haydn/Hasse program at the last minute when Taryn came down sick. Some practices - and presumably some trepidation - later, and the performance was sweet and neat. Celeste's soprano is firm and strong (she's a principal of Opera Australia so sings in big company) and a challenge for the sweet period tones of gut, but it worked a treat. 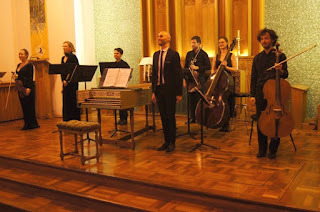 I loved her voice, loved the carefully responding musicians, Erin's casual guidance, the bouncing bows and the just-present plucks of harpsichord and diverse tones of melody from violin and flute. AHE are always a great pleasure and this was there with the best. I am enjoying this! My week is punctuated by various musical outing, not least two (2!) 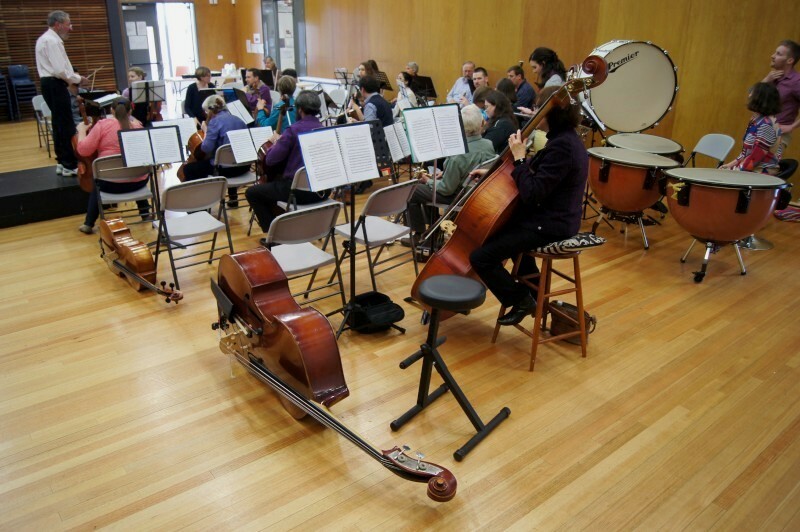 orchestral rehearsals on Saturdays. This week was busy with concerts, too. Two little orchestral outings for whoever from Maruki was able to turn up. Both were community events: one for the parish that hosts our practices; the other for a prize-winning teacher at Canberra High School. Canberra High was fun, with a very large, if obligated, audience for their school assembly. 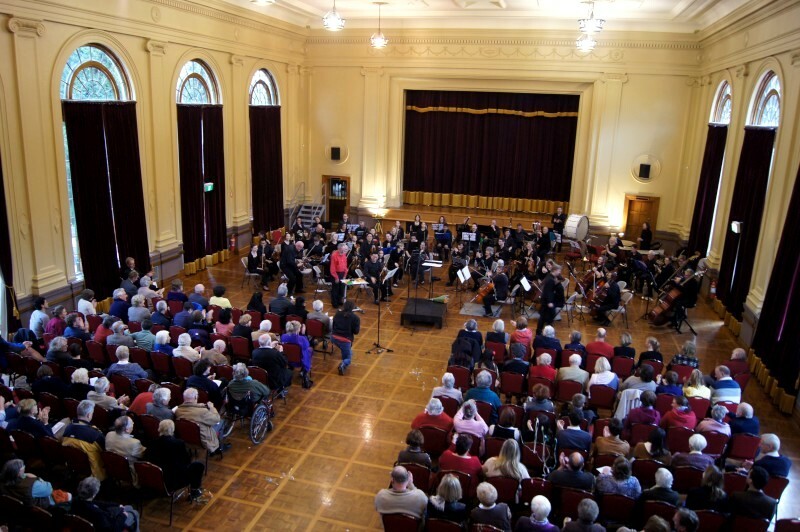 But in addition, a jazz outing for Tilt at Albert Hall (of the classical, read live, acoustics) for the Artists Society of Canberra Spring Fair. All fairly low key, none particularly remunerative so justifying a relaxed presentation, but all treated with due seriousness. 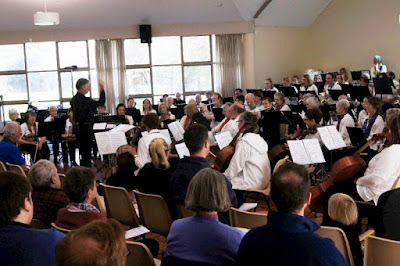 The Maruki gigs had us reprising Strauss and some Dvorak from the last concert and taking some first bites at Bach Orchestral Suite no.3 which we will play in full (with Beethoven 3rd, Eroica) in early December. 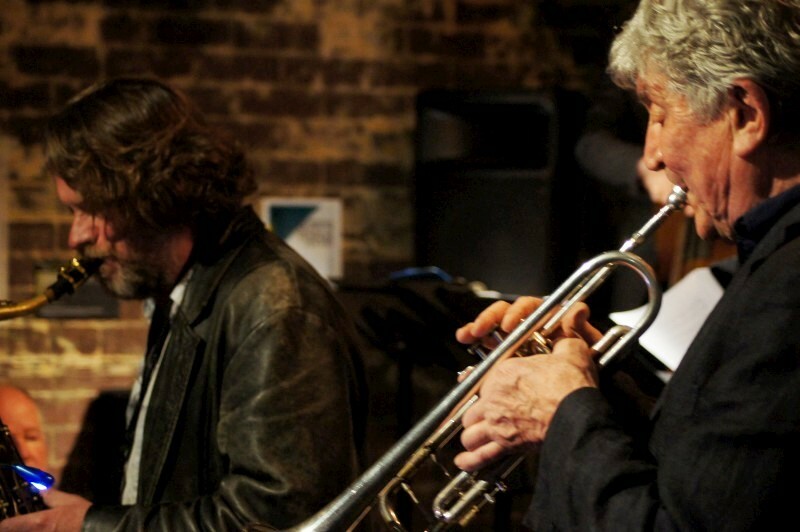 The Albert Hall gig was an opportunity to play with effects for a more edgy jazz/pop presence. Much fun. Thanks to all my offsiders. I've included a few snaps of some ASOC art that appealed to me. 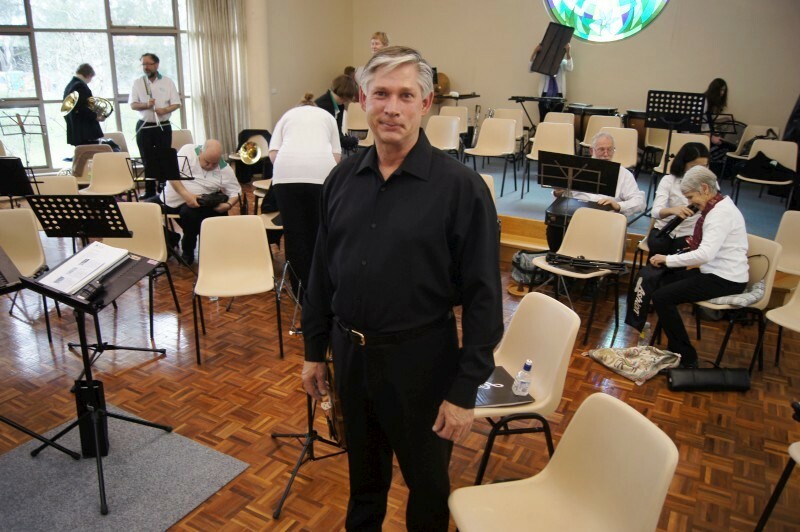 Maruki Orchestra is conducted by John Gould. 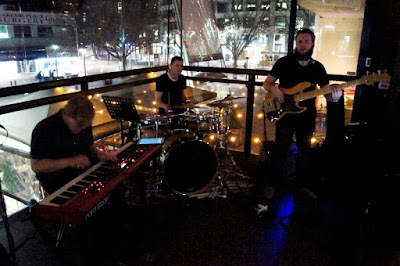 Tilt comprises James Woodman (piano), Eric Pozza (bass) and Dave McDade (drums). They have a strange, if descriptive, name. And they play strange, if adventurous, takes on Summertime and My favourite things. I was warned for Summertime, but I wasn't for Favourite things and I didn't pick it. Strange, too, that this band won a chamber music competition. But they are young and skilled and searching, so it's appropriate. They are Three Men One Chamber. I'm not sure I particularly get the reference, other than through the competition, but they were good. They play those twisted standards, but also takes on various current pop tunes as well as originals. I think it was the busily virtuosic tune called 13-7 that won them the competition. That was the last tune and it was a standout. Plenty of unison playing in odd times by guitar and bass. I was pleased to find a new and interesting bassist when they covered the tune Daylight, by LA bassist/singer Thundercat. They also took on an Aphex Twin tune, but I show my age by remaining non-plussed by this style. The players are Brendan, Stephen and Hayden. 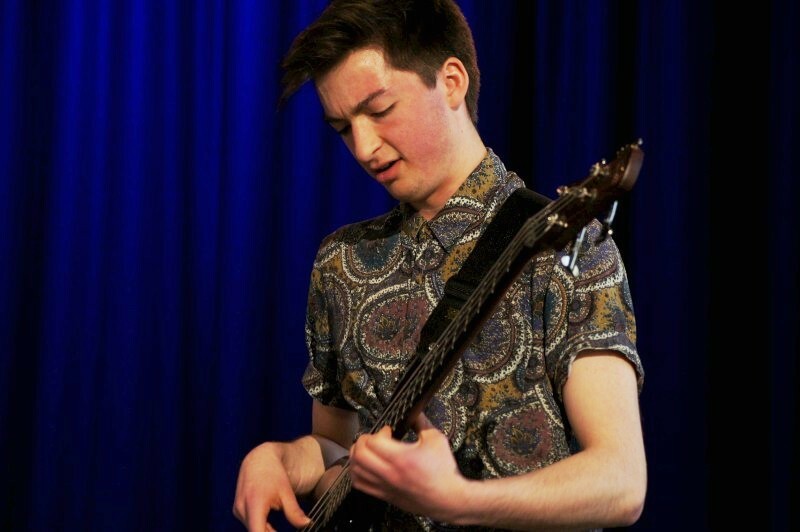 Brendan's bass is upcoming at the School of Music and a player to watch. Stephen and Hayden were less extravagant but I found both very satisfying. Very nice little band. Their success in a chamber competition may be unexpected, but it's obviously valid on the strength of this outing. 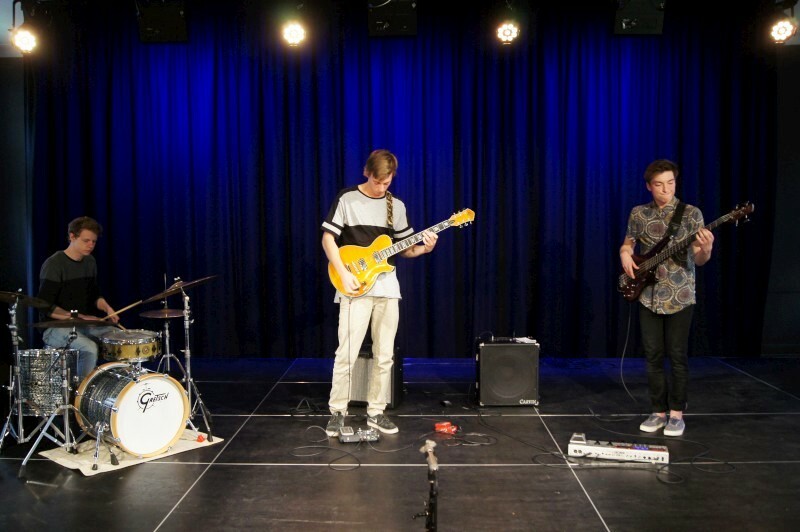 Three Men One Chamber are Stephen Read (guitar), Brendan Keller-Tuberg (bass) and Hayden Fritzlaff (drums). They played an "Out to lunch" session at the Ainslie Arts Centre. There was just one point when I was taken aback by how sophisticated was this music. Antipodes was playing at the Ainslie Arts Centre. These are a band of Sydney-based musicians, but a collaboration of Australians and New Zealanders. Locally, we know Luke Sweeting and Max Alduca well, having had them studying during the better days of our Music School. But I suddenly realised how perfect were the harmonies of the front liners, how neatly the bass line sat, propelling the music but unhurried and unforced, and the drums that seemed so understated then would come alive for a solo or a responsive fill or the guitar that delved into sequences and the rest but also could just be there, supportive, and Luke's piano, of course, ever present and ever apt. The sound all merging so neatly and correctly and satisfyingly. I thought of the careful, distilled music of CTI in the '70s. It had that air of clarity and refinement. Then to think of the tunes. These were all originals, and in 9 tunes there were four writers: three from Callum, two each from Luke and Simon, one from Jake. And all competent, interesting tunes. Another plus; another mark of sophistication. This is antipodean music of depth and content. I wonder if we still deserve this, in our era of destruction and immediacy. Ocean sounding song reminded Luke of ocean sounds (obviously enough). The Ditch was an apt concern for this antipodean mix. Anthem was the NZ anthem rearranged. Mister Bank was a dedication to a band that has Luke obviously admired in this travels. A few others with less obvious titles. Classy playing with deep intent. Too poorly attended, but like I wrote above, do we deserve such stuff as dreams are made on? Our times seem better suited to Hillary Duff's take than Antipodes'. 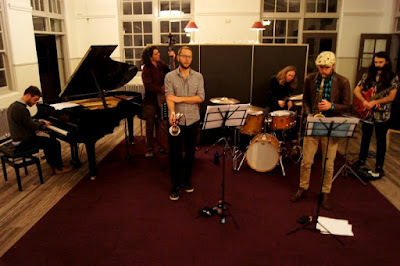 Antipodes are Jake Baxendale (alto), Luke Sweeting (piano), Callum Allardice (guitar), Simon Ferenci (trumpet), Max Alduca (bass) and Harry Day (drums). Antipodes played for the Confluence series at Ainslie Arts Centre. It's an audacious undertaking, to write a new line for violin to accompany the Bach's Goldburg variations. Zoe Black had asked Joe Chindamo if he could write her a part to play. There are arrangements of Bach and others that take various contrapuntal lines and separate them out for various instruments parts to play, but this is retaining Bach's notes. It's more daring to take Joe's approach: to write accompaniment in the style of Bach but, it seemed to my ears, with the awareness and influence of following periods, not least jazz. But then jazz is often mentioned with Bach. In performance, Joe played the original Bach score on piano; Zoe played Joe's composed counterpoint / response / improv. Joe spoke of this as "akin to introducing another character into one of Shakespeare's plays" and interestingly, that as he worked, it seemed to him as if the "original keyboard part began to posthumously respond to the violin". I could imagine that, given the immense and daring task he had undertaken. So how successful was it? It's a mammoth work of real commitment and love. The violin part is immense and virtuosic. I sometimes lost the mutating harmonies of the baroque amongst some startling violin lines, and this was partly a matter of balance. I wondered if performance on period instruments (I'm pretty sure this was on modern instruments) might have melded the tones more and spelt the era and highlighted the counterpoint. I didn't catch all the counterpoint on the night, but listening to some snippets now on the net, it seems deliciously true and appropriate to JS to my ears. 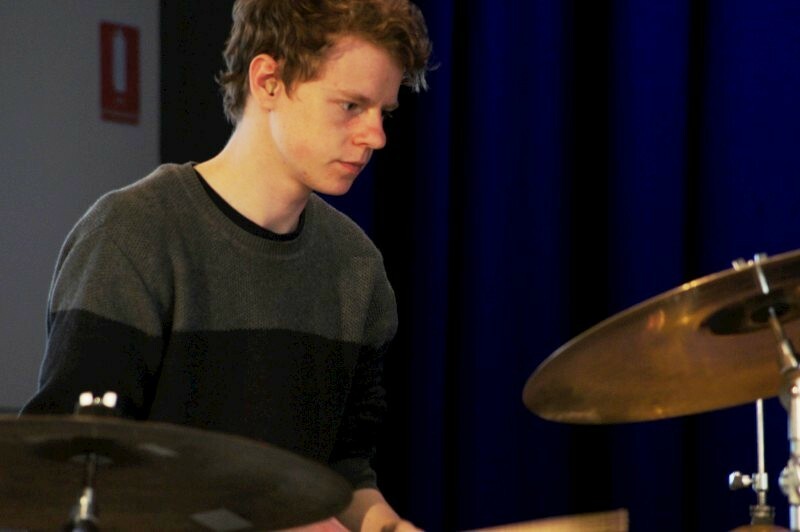 Great playing on both parts and a stunning compositional achievement by Joe. I'm in awe. Joe Chindamo (piano, composition) and Zoe Black (violin) performed Goldberg Inventions on the stage at Llewellyn Hall. Goldberg Inventions is Bach's original and complete Goldberg variations with a newly composed counterpart for violin. 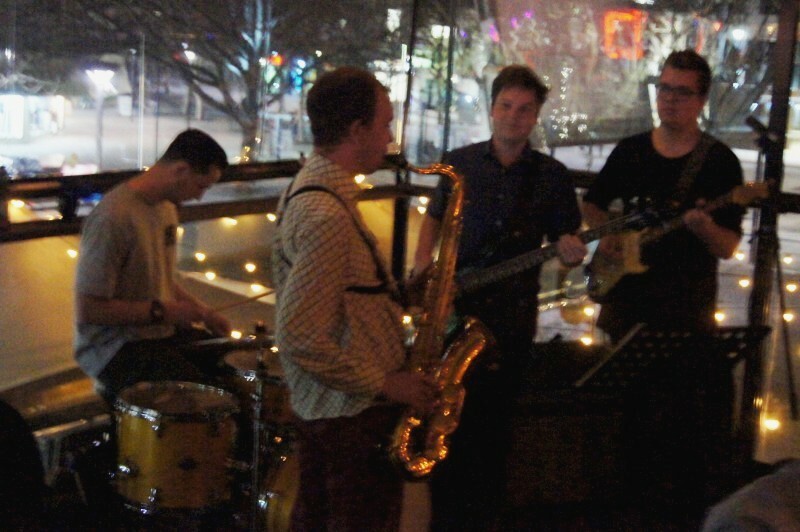 Great fun had when Tilt played a first gig at the Tradies. Lovely to play with a nice, acoustic, Kawai grand. Plenty of space and a laid back environment. I like a gig like this. 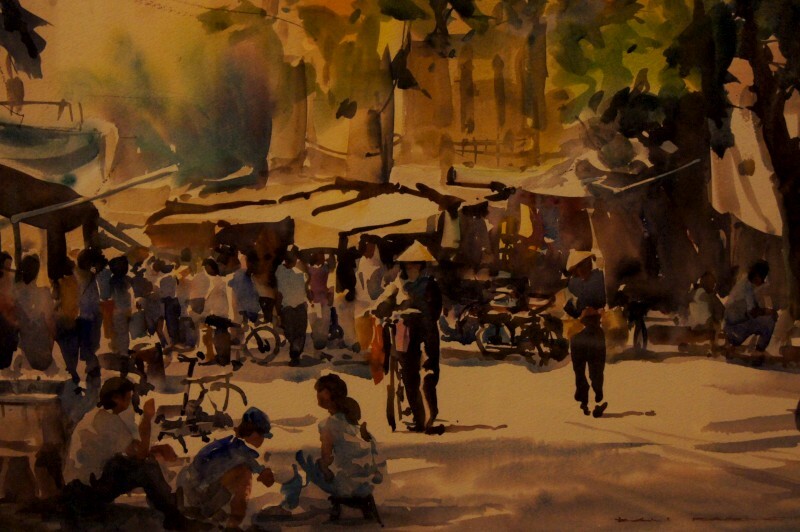 People spread over a large area; plenty of space; relaxed; some people responding, others just there or at the pokies or housie. But there's an cool awareness, or at least we can allow ourselves to think it. Perhaps you could say Tilt is tilting at windmills, doing a jazz/pop cross, but I prefer to see it as a continuum rather than Abbottian conflict. Swing is great but not all and it's not in everyone's direct experience. 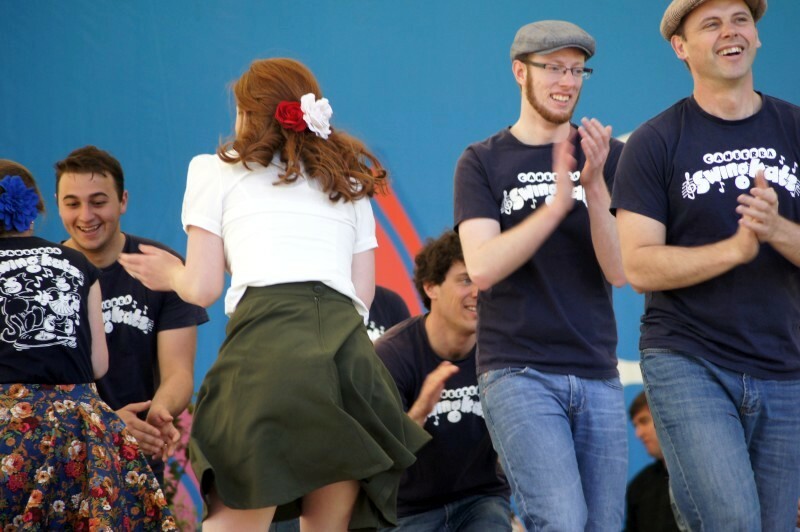 But play something they recognise, and listeners will warm to a band and be open to other tunes and styles. So mix post-bop and modern and swing with grunge and pop and R&B and you please all and enjoy the outing, too. Early days yet, but entertaining. Tilt next plays at Dickson Tradies, 5.30-8.30, Thursday 1 Oct, and hopefully thereafter. Free entry. Tilt (trio) are James Woodman (piano), Eric Pozza (bass) and Dave McDade (drums). I can despair over climate change, the breakout of wars, today's article saying life at sea has halved in the last 25 years, refugees and lots more, but maybe I am too fatalistic. For all's sake, I hope so. I got a little uplift with Turnbull rolling Abbott, and I await with just a little hope the outcome of Paris. So perhaps I am not the best auditor of a session by two new (class of 2013) Labor MPs, launching their new book, Two Futures : Australia at a critical moment, arguing for long-term thinking by imagining two possible visions of Australia at 2040. Ben Oquist introduced Clare O'Neil and Tim Watts. Both young and presumably hopeful and, to my eyes, strangely similar in appearance to the two Green deputy-leaders. Maybe it's a generational thing. Abbott has just been rolled by Turnbull who at least recognises science and climate change, although will have internal disagreements with the right of his party, but this didn't feature much. Instead we heard of the longer term (are things looking up? A session on politics that isn't trumped by today's, admittedly significant, activities?). Ben Oquist succumbed, saying Abbott was really a good communicator (unlike Turnbull's argument). I agree. Abbott's problem was overreach. Repealing the carbon tax was not enough; he had to go to war with environmentalists with led to backlash. (In my book, not one to do things by halves ... or sensibly). But Clare and Tim avoided the daily matters. Clare started, introducing the first three of the six themes of their book. 1. Equality / egalitarianism. There's a gap between rhetoric and reality. The wealthiest 9 Australians have the same wealth as the bottom 4.5 million. Technology and other forces will increasingly influence wealth by 2040. How can Australia respond? She specifically argued for early childhood education (and I read in today's Canberra Times that 15hours of free early childhood education will be provided to all children in ACT - just what Clare was arguing for, even the 15 hour minimum). BTW, some countries have 100% of 3 year olds in early childhood education; Australia has 175; apparently it's well supported by evidence. 2. Climate change. Old Bar is a coastal NSW town where 1m of sea front is lost per year. Residents want a sea wall; there's argument about who pays; for sale signs proliferate near the water. This is climate change arrived. (For just one more confirmation of our unsustainability, see "We've wiped out half world's marine life in one generation" in Canberra Times 17 Sep 2015, p.6) Clare also spoke of green jobs (1m new green jobs internationally; -2K jobs in Australia; not sure of the measure, perhaps annually under Abbott?). 3. Growth / economy. In 1980, Lee Kwan Yew predicted Australia to be the "poor white trash of Asia". Then Hawke, Keating and Howard, reform and mining, but now Government has little left to reform other than innovation policy, and as for supplying jobs to Asia, our education is dwindling as Asia soars. Tim did his bit on the next 3 themes. 4. Democracy. "It matters" (sadly appended: "for economic matters". I think yes, and for more). Australian political institutions have responded well in the past, but now? There's now deep dissatisfaction; what major reform has recently survived Parliament? (Perhaps NDIS announced that very day; previously, GST). Talk of bigger ideologies, tailored solutions, possible reforms. (My thought is conventions and goodwill will salve much of this, but they talk of reform). 5. Technology. Connectivity and digitisation has radically reduced transaction costs. There's good and bad; employment becomes atomised. A suggestion is computational thinking. (My thought is increased productivity is good: the problem is how to share the benefits).6. The world. Geopolitical / geostrategic changes are big! Australia previously had external guarantors for security (UK then US). By 2040, several regional nations will be stronger than Australia (he mentioned Sth Korea, Japan, India, Philippines, Vietnam). Commit to joint security, role in ASEAN, develop soft power (eg, Abbott defunded the Australia Network; as I remember, Howard sold off Radio Australia transmitters - bought by the religious right; the Union Jack and the Queen remain as our soft power symbols). Then questions. A new Australia Network required; new technology needed to aggregate political involvement; business involvement in Asia needs to be developed; learn from NZ (a popular position with the recent flag process); be skeptical with new ideas, reinvigorate the old (I was amused by a related comment of "Labor as road kill"); means of boosting voting enrolments; how many pollies think or are interested in the long term? ; dealing with business involvement in the political process (Tim suggested the main issue is direct political campaigning by business [not sure I agree] which is a tall ask to deal with; rather there's a need to broaden political involvement/discussion). Well, it was just a touch of what is argued in the book. I felt a little alienated; I worried that magic fixes were sought where disrespect of conventions and hard-bitten politics seems the core problem. But things move on. Good to see some pollies are thinking of these things and the 2040 timeframe seems an apt scope for vision. Clare O'Neil and Tim Watts are newly elected Labor MPs (2013). 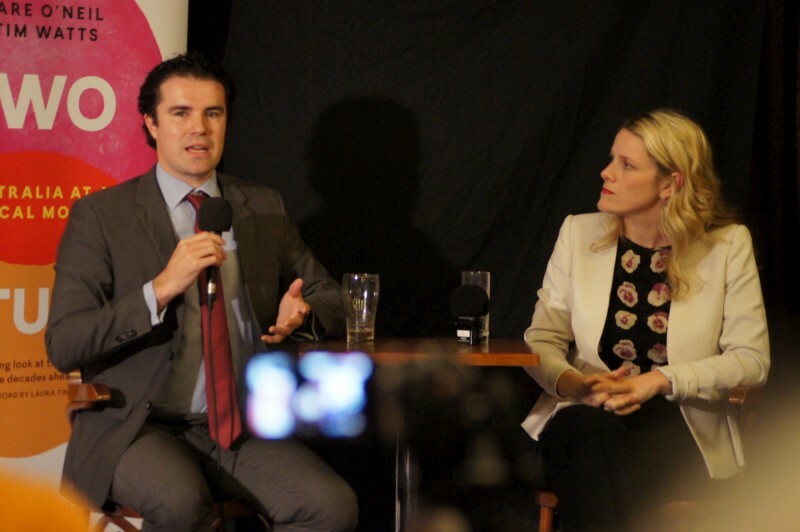 They discussed their new book, Two futures : Australia at a critical moment, at a Politics in the Pub. Ben Oquist introduced them on behalf of the Australia Institute. 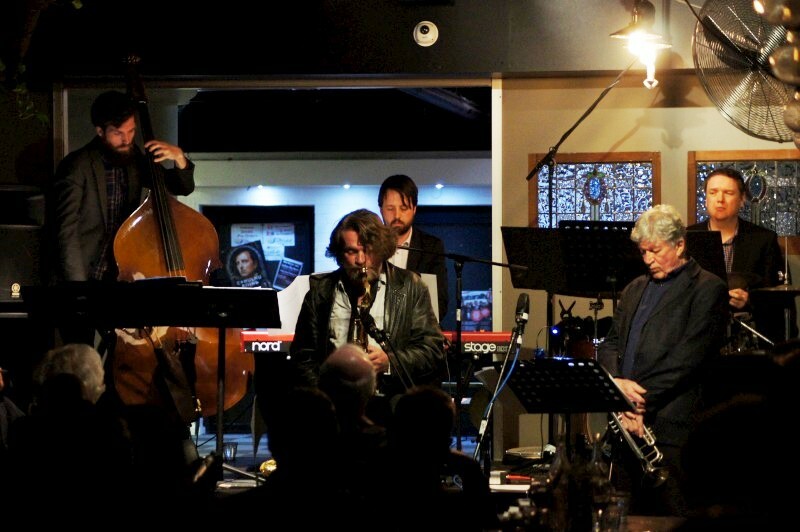 Congratulations to Hippo for its 15th year of jazz. And jazz goes back further in this spot. I remember it as Dorette's with the SOM students who have since moved to Sydney and JazzGroove and more. Venues move on, but Hippo has a respected, if noisy, long-term relationship with jazz and that's something to celebrate. So they did, last Wednesday, with a string of bands and free entry and masses in house for cocktails and whiskys and whiskeys and more. It's gone through a few interior redecorations, added a balcony, recently provided a stage area with big-city light-filled backdrop (I like it), staged tons of Australian and Canberra bands and a string of internationals. Yes, it's noisy, but that's the business. At least a venue remains with a considerable history. Thanks to Hippo, now HippoCo, and congratulations. There was talk of Robert Schmidli's last concert at Wesley, playing Scriabin. I missed it. That was more obscure and took more preparation. Immediate preparation, that it. This concert comprised two piano sonatas from Mozart and Beethoven. Robert had been playing them for years, so the preparation was there, just not so recent. I liked to hear the very diverse concepts of these two composers. This was late Beethoven (piano sonata no.31 Abmaj op.110) displaying his commitment and passion and that inevitable turn of phrase that always seems predestined. And Mozart (piano sonata no.8 Amin K310) with his earlier, more obvious and classical view, stately and proud and also playful. I enjoyed both. Robert spoke of a section in the last movement of Beethoven with doubled dims and augs held together precariously with syncopations. Robert is a local doctor, but a serious amateur pianist with training. Nice to have around and great to follow. Robert Schmidli (piano) performed two piano sonatas, Mozart no.8 Amin K310 and Beethoven no.31 Abmaj op.110, at Wesley. As we read Canberra Times and Facebook of the history of ructions at our own Music School, it's interesting to have visitors from another place and another school. Jacob Neale and his trio is from Newcastle and they came to play at Hippo last night against a new, very light-sparkling backdrop. Very NYC or Binhuis: I like it. Jacob and the band played a mix of originals and standards. Standards like Have you met Miss Jones, Green Dolphin St: stock standard stock mostly played tonally and swinging, although Jarrod was want to break the swing and syncopate. No singing, jazz trio, so plenty of solos. 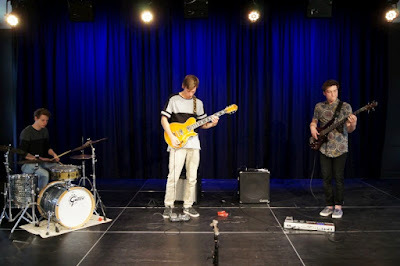 Jacob liked the rapid, mostly harmonically true solo, fast and furious; Jarrod also played the chords, enjoyed the area up the neck, or sometimes down below E (he was playing a 5-string, pretty sure the Fender Marcus Miller), liked the occasional chordal colours and funky spaces. The originals brought this out, to my ear. Funky dotted rhythms, perhaps simple chord patterns. One was a dedication to Monk; another was a blues. Sam held all this and took a solo or two. I stayed for the first set only, after tipping candle wax. The lighting outside was a little more exciting (and functional) than the '60s basement candles inside, but I did notice how candles are generous to the visage and that goes down a treat. Beards and candles and streetlights through plate glass. A strangely modern scene. 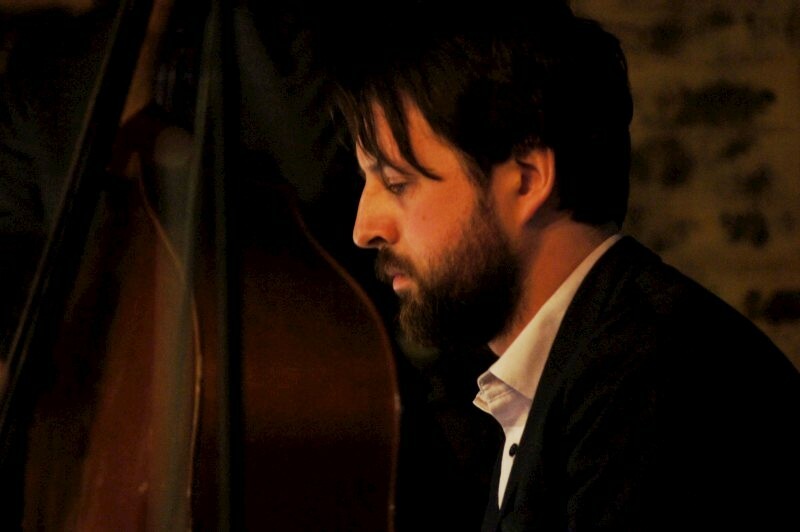 Jacob Neale (piano) led a trio with Jarrod Gibson (e-bass) and Sam Evans (drums) at Hippo Co. Finally Selby. I've heard about these concerts but never attended. 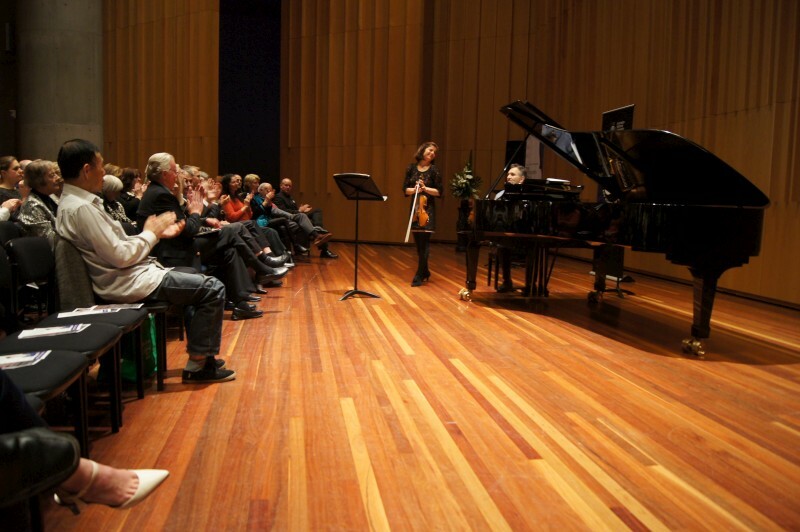 Kathryn Selby is a Sydney pianist. She regularly gathers some mates, top players in Sydney, to perform at the NGA (and Angel Place in Sydney). It's chamber music, ranging over time. 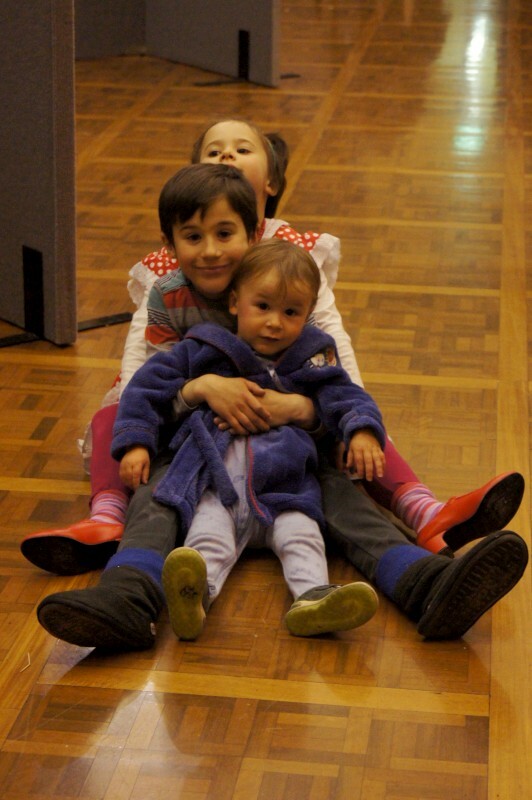 This time her friends were Sophie Rowell, Tobias Breider, Julian Smiles and "development artist" Anna Da Silva Chen. The music was great, but so was the performance. Absolutely convincing. They started with Ross Edwards Piano trio (piano, violin, cello), then Fauré Piano Quartet no.1 C minor Op.15 (added viola), then Schumann Piano quintet Eb major Op.44. The titles were none too flash. I was chatting with others after about favourites, but I couldn't pick one. 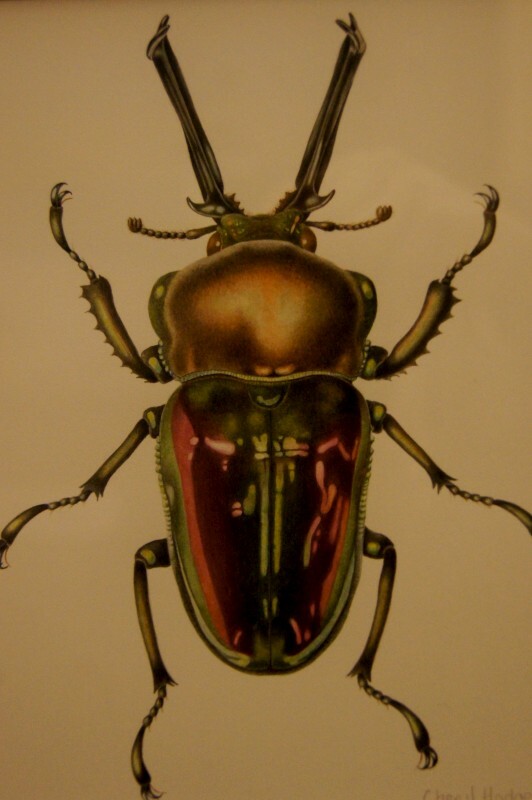 They were all hugely different in style, but impressive and demands and also in interest. My ears pricked up for the spacious piano and melodic cello and the explosive third movement in Edwards. But the canon and the pizz with gambolling piano in Faure appealled. And the attractiveness of the whole and fiery running scales in the fourth movement of Schumann. These guys had serious chops. Julian Smiles played with tablet and foot page switch, but he seemed to have a terrific memory: he didn't seem to look at it too often. The others had paper and Kathyrn had her page turner. All standard. And it was nice to see a young player being brought into the fold. She was very good but the difference is apparent in an A-B comparison like this. But this was seriously satisfying chamber music. Good reason for the following it clearly has. 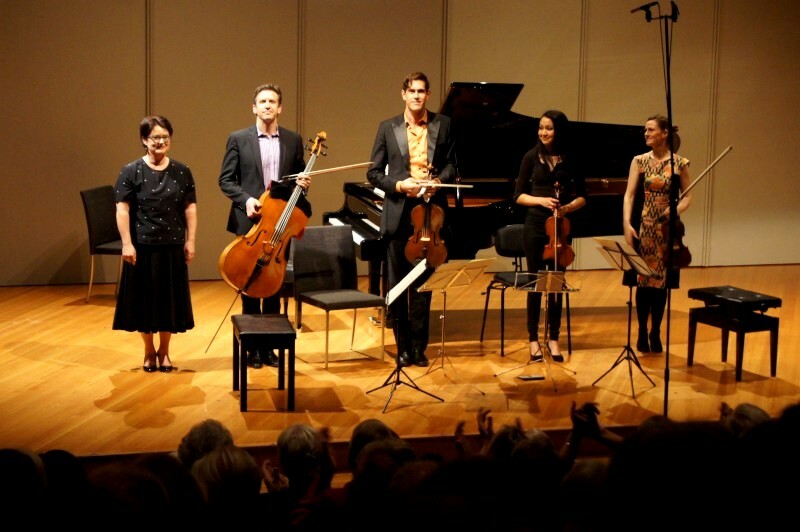 Kathryn Selby (piano, leader) performed with Sophie Rowell (violin), Tobias Breider (viola), Julian Smiles (cello) and Anna Da Silva Chen (violin) at the NGA theatre. How do you come down off this? Tired but elated. 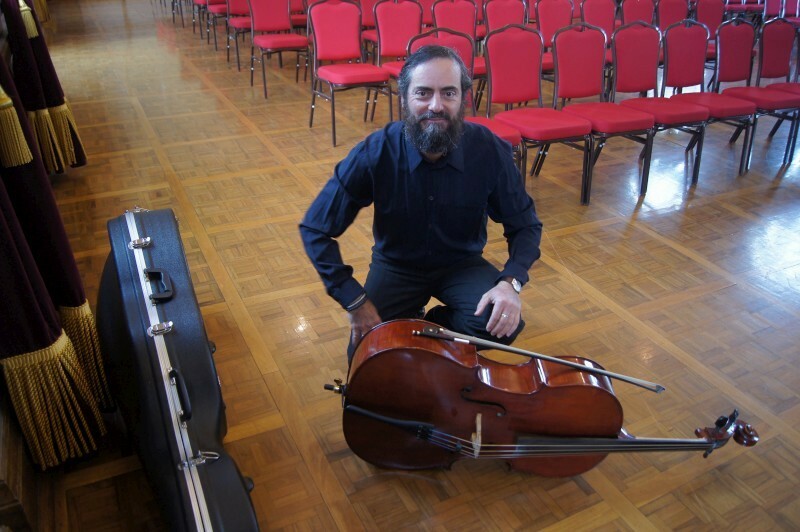 I've just performed my fifth symphony concert, my second with Maruki Community Orchestra. Program? Dvorak Symphony no.9 From the new world; Beethoven violin concerto; Strauss Emperor concerto. I recorded and it's quite decently presentable. I found new mistakes to play, but fixed some others from rehearsals. I left the mute on for the second half of the Dvorak. Neither were mistakes that others didn't complain of. I wonder how the profs do it. To what degree do they hide mistakes? I guess quite frequently; covering is a professional skill that musos don't acknowledge too readily. Maybe those recordings don't get published, but then the recording I was using for reference had coughs and frequent clarinet squeaks and more. That was not pristine, either, but neither was it the Berlin Phil. John Gould, our normal conductor, played the violin concerto and it was a stunning achievement. But then John has history with the London Symph and more, so not unexpected. Leonard Weiss covered as conductor for that piece and did a wonderful job. There's something about performance that demands and draws the best of your playing. Nothing unexpected there, but the playingn was the best to date in rehearsal yesterday and peaked today with an audience. It's adrenaline, commitment and more. 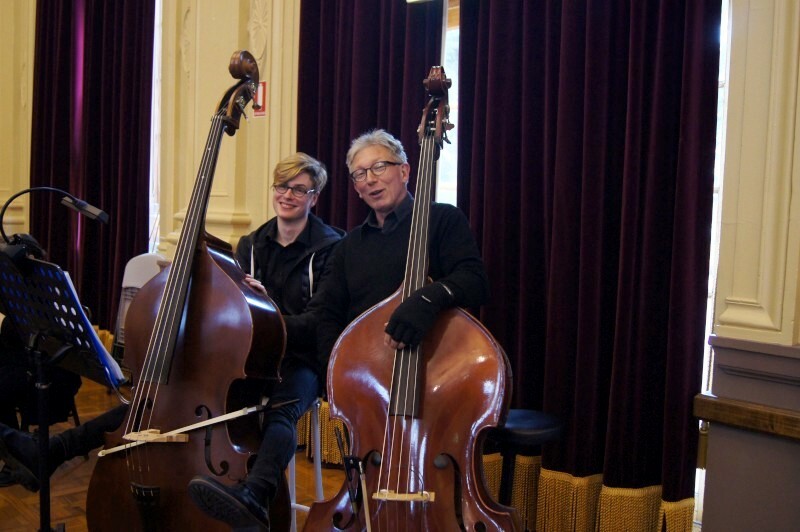 The bass section was Matthew and me, and Matthew did a great job despite his recent entry to the orchestra. But then, he's got serious background. I remain somewhat in shock, but elated and exhausted. Not an easy job, this, playing hours of dots, not least with the intensity of Dvorak. But how cool and how exciting it this! The Maruki Community Orchestra performed Dvorak Symph no.9 From the new world, Beethoven Violin concerto and Strauss Emperor waltz at Albert Hall. Led by John Gould (conductor for Strauss and Dvorak, violin soloist for Beethoven), Leonard Weiss (conductor for Beethoven). Basses were Eric Pozza and Matthew Gambrill. PS. A few days later. I've listened to the recordings. I'm more relaxed about it all. Maruki takes on the real thing; these charts are just what Berlin or Vienna or London Phil play. This time it was Beethoven and Dvorak with Strauss to warm up. We're a community orchestra, so we can't expect Heaven, but this gig was good. Better than the previous Beethoven 5. It helps to have some experts like John and Lennie amongst us. And this was a significant event in other ways, too. 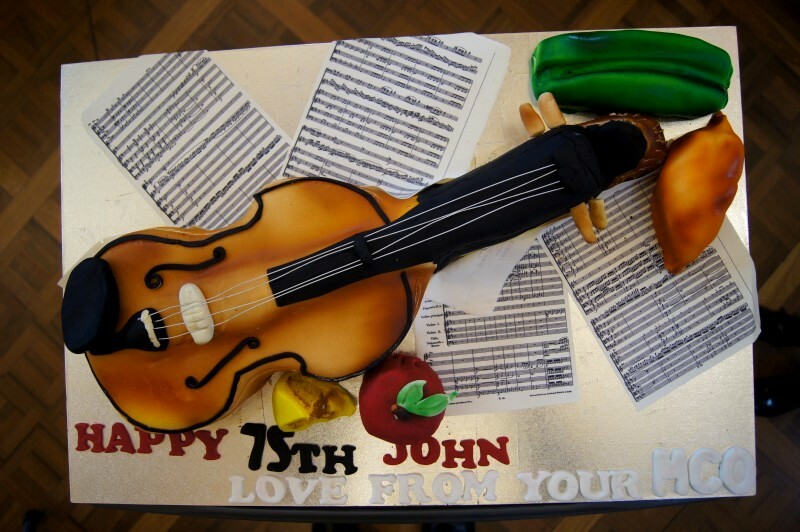 John's 75th birthday (his next Beethoven Violin concerto is at 80) and Maruki's 10th anniversary. All exciting, but nothing like the thrill of doing it and getting those hard bits right when they are got right. For the errors, well, there's another day. Thanks to Maruki and John and Lennie. Great stuff and much enjoyed. 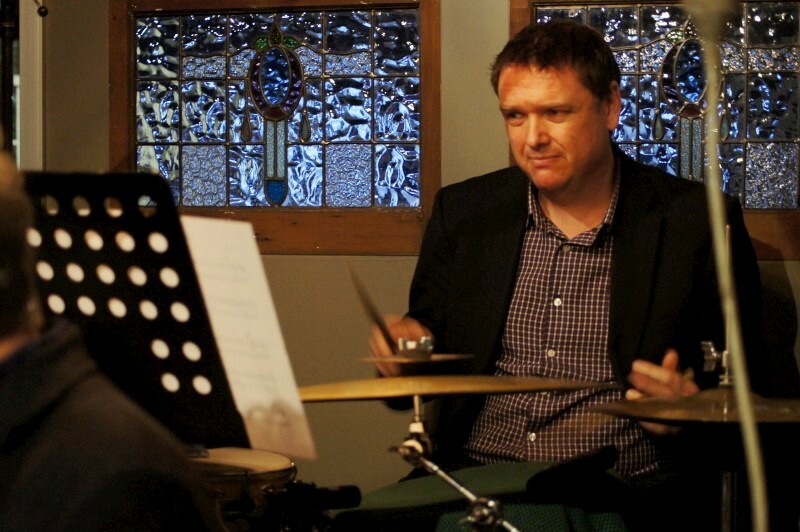 Johannes Luebbers led a band at the Gods and it was a combination of old and new friends. JL is one of the new breed at the School of Music. 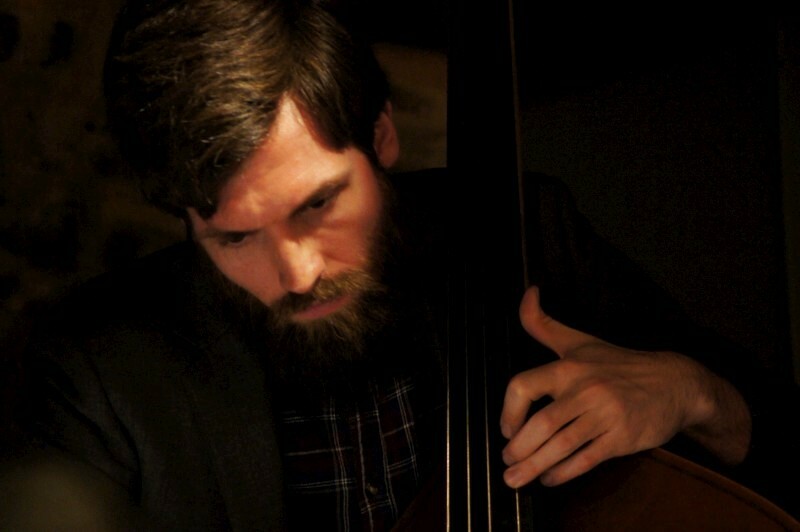 So is bassist Alec Hunter. Whatever we think of the changes, none of these people had anything to do with it, so best to them. 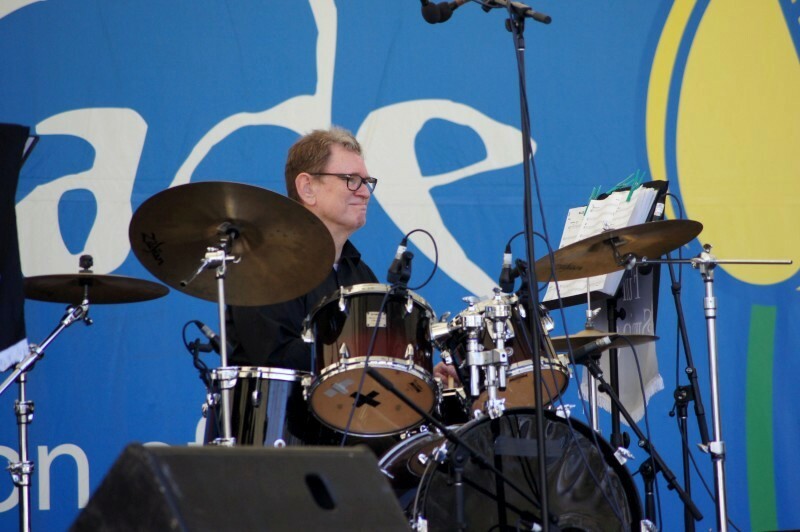 They played with masters from the previous incarnation, of the Jazz School, Miro and John Mackey and Mark Sutton. All masters: they had to be to play this at short notice. Miro showed me a chart, all time changes (4/4-5/4-6/4) and sixteenth notes and then the sticky-taped pages fell open and touched the ground! There must have been 7 pages of this stuff to read! The players were all groaning, as players are wont to do for difficult charts, but ready to take it on. Miro commented he's "not an accountant". But he counted and they did a great job of it all. They were mostly playing charts by Johannes. 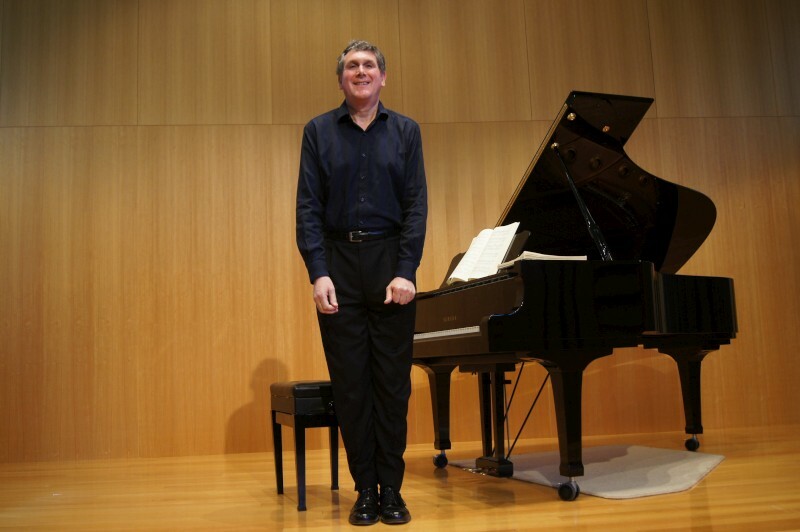 Johannes played piano but is principally a composer: he said he's usually out front conducting his works rather than sitting amongst the players. How much I liked this! 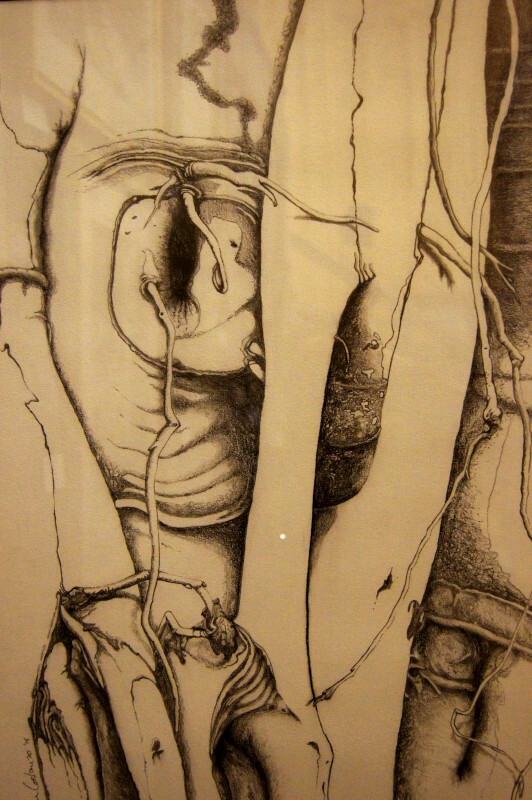 Complex, busy, original works with limits on repetition. Spaces for solos - this is jazz, after all - but plenty written for ensemble. I melted with some of the superb harmonies from Miro and John. How correct and sweet can intonation be? And solos from them were equally breathtaking. I also especially noticed some of Johannes' comping, all harmonic colour and movement from a composer's point of view. Alec played with bow, sometimes with bass noises, but mostly played with clarity and a neat firmness. Mark convinced as always and let go for one later solo. They had planned one standard to finish off, I remember you, but ended up adding Alone together as an encore. I play that tune regularly and could just wonder at how the best manage to embroider a tune. Quite remarkable. Old and new, from before and after a disaster. Johannes Luebbers (piano, composition) led a quintet with John Mackey (tenor, alto), Miroslav Bukovsky (trumpet), Alexander Hunter (bass) and Mark Sutton (drums) at the Gods. This Brindabella Orchestra concert was something like that: arrayed forces. Because it was big. 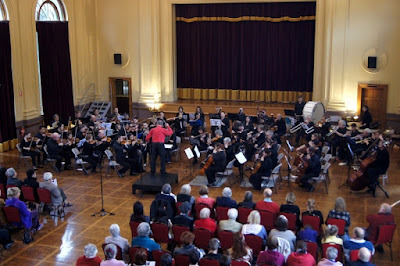 Brindabella played with Weston Winds and some guests, so the stage was packed with players and the roof lifted when the brass let loose. And the theme was WW1, the Great War, with tunes from the era, so often touching, occasionally bombastic and nationalistic. Yes, and because we played God save the King (for king he was as that time) and our own little number, Advance Australia Fair. It all worked a treat, better than I'd hoped (especially after a few weeks away with no practising) and was a blast when the whole outfit started up. Not that I liked the overt nationalism that is people standing for the anthem. We are more nationalistic and overtly proud these days (Anzac Day in the '60s was nothing like it is now, but then we had many returned soldiers who knew the hell it really was. There are fewer surviving returnees these days (mostly some Vietnam vets, Middle East, perhaps Korea and WW2) and we mostly just have pollies using and abusing and playing at militarism, viz, Operation Fortitude as the latest dangerous blunder). So, I felt uncomfortable when the audience stood but I have a very nice male voice on the recording, singing along, so not all bad. The program was made up of a few pieces for Weston Winds, a few for the Orchestra, a few combined and one song with piano. I liked our Tunes from the tranches medley, not least the appearance of Land of hope and glory (I am not immune from these emotional stirrings), and Banks of green willows (George Butterworth) and Elegy for strings (FS Kelly) were touching and all colours and spaces, as are poems and pieces from those who experienced the war. The Winds played Holst First suite in Eb 1st mvt and I was taken by a spot that was all the world like a jazz solo played by saxes with band accompaniment, and otherwise some nice melody passed through the band. Lachlan McIntyre, currently studying at ANU School of Music, sang By a bierside by Ivor Gurney, which BBC Four describes thus: "Surrounded by the chaos of the trenches, serving soldier Ivor Gurney composed a number of haunting songs, including 'By A Bierside'." (http://www.bbc.co.uk/programmes/p01w9ry3). Orchestra and Winds played well and the program was nicely constructed, so, a very successful and nicely themed concert. Brindabella Orchestra and Weston Winds were conducted by Peter Shaw in "From Gallipoli to the Somme and beyond : music from the WW1 era". Lachlan McIntyre (vocals) featured. Too many perfomers to list.